EDIT: Giveaway is officially over. Congratulations to Lynn Mathieu for submitting the randomly chosen 655th entry. I heart free stuff, don't you? 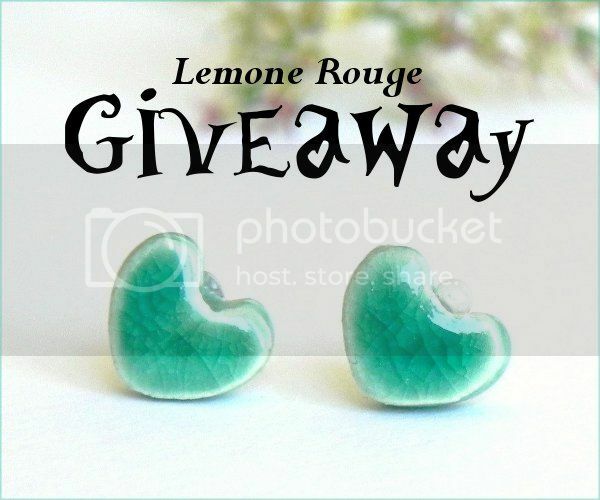 I have some lovely news for those that agreed - Ildi of Lemone Rouge is giving away not one, but any TWO pairs of tiny stud earrings in her Etsy shop to one winner. All handmade earrings are baked in a kiln, glazed, fired again and lastly attached to hypoallergenic surgical steel stud posts. The lucky winner could choose cute heart earrings like the mint green ones above in a variety of colors. Or if heart-shaped jewelry isn't your style, Ildi crafts earrings in several other simple shapes to match any fashion trend. Her ceramic designs are modern, minimalistic and best of all ... shiny! Use the Rafflecopter below to enter to win jewelry giveaway before 11:59pm EST on June 5, 2013. Be sure to leave the mandatory comment on the blog post with the same name you use to fill out the Rafflecopter - all entries by winner must be easily verified or a new winner will be chosen. Not including usernames when asked will also get you disqualified. I love the cute Tiny Blueberry Round Studs! I love the Emerald green tint post earrings. I really like the flower studs - mint, red, and the royal blue are really pretty. Oh I really love "Ceramic Tiny Heart Post Earrings Mauve Pink Hypoallergenic Studs"! I like the Unisex Black Round Post Earrings Mini Shiny Ceramic Studs Hypoallergenic Post Modern Pottery Jewelry for Man. vera khule at gmail dot com. I like the Bronze Black Flower Tiny Stud Earrings Ceramic Small Shiny Flower Posts Unisex Jewelry! I love these: Pink Ceramic Round Post Earrings Patel Pink Shiny Hot Pink Dots Tiny Ear Studs. LOVE the Mint Tiny Stud Earrings Heart Ear Post Ceramic Jewelry!! SO cute!! The Blue Ceramic Post Earrings are my favorite....but love them all! I love the mint tiny stud heart earrings! I like the heart shaped Apple Green Ear Studs. It's a really cool color! I love the mint drop stud earrings! My favorite item is the Apple Green Ear Studs Neon Earrings Tiny Ceramic Posts Hypoallergenic Heart Pottery Modern Fashion Jewelry! I love the tiny round blueberry studs. I love the blue heart studs! I love the Mint Drop Stud Earrings Minimalist Aqua Ceramic Post Earrings Hypoallergenic! I love the apple green ear studs and bronze heart studs earrings. WOW who wouldnt love to win a pair of these!?!?!?! I especially love the mint raindrop earrings! Thanks so much for the giveaway and good luck to all who enter! Love: Pink Ceramic Round Post Earrings Patel Pink Shiny Hot Pink Dots Tiny Ear Studs. They remind me of macarons. My favorite item is the Mint Drop Stud Earrings. Loving the mint ceramic round earrings! I love these! They look like tiny pink macarons! I love the Orange Tiny Stud Earrings and the lovely Bright Gold Stud Earrings! These are so cute: http://www.etsy.com/listing/124499483/tiny-purple-stud-earrings-eggplant?ref=shop_home_active. I also love the ones you've pictured above! I Loveee the heart studs!! I love the triangle ceramic post earrings! I love the peach flower post earrings! I like the peach heart earrings! I like the tiny heart post earrings. I love the tiny heart earrings. Would love to win it and be lucky ! My favorites are the ceramic mint studs.. circles and stars! I love the Pink Ceramic Round Post Earrings Patel Pink Shiny Hot Pink Dots Tiny Ear Studs. Love them!! thanks for the giveaway!! Love the pink ceramic round post earrings. OH yes...love the apple green earrings!! Hard choice, but my favourite earrings are the Unisex Black Round Post Earrings. I love the stud earrings geometric aqua round pottery. Thank you! I had a hard time deciding, but I really like the Bronze Black Flower Tiny Stud Earrings. Love the bronze black heart studs! I love the mint drop studs! And my email in rafflecopter is vazngurla(at)yahoo(dot)com for confirmation! They are all so cute! I really like the mint drop stud earrings!